Let me start by getting you thinking with a little puzzle. A bat and ball together cost $1.10. The bat costs $1 more than the ball. How much does the ball cost? Did you arrive at 10c? Then you’re a fast thinker. Answer to the puzzle at the end of this article. As leaders, we have myriad tasks to perform, goals to achieve and people to develop, yet there are only so many hours in the day and sometimes, something’s have to give. When it comes to leading and developing our people, it is rarely or never our intention to compromise but compromise we do, often without conscious awareness. This is what we are going to explore. In his book ‘Thinking Fast and Slow’, Psychologist Professor Daniel Kahneman invites us to consider the metaphor of 2 systems of thinking. System 1 is reflexive, fast, automatic and largely unconscious. System 2 is reflective, analytical, deliberate and conscious. Think about a drive that you do regularly, maybe it’s a commute – have you ever arrived home unsure as to how you got there? System 1 at its best. However, choose to drive in a European country, or in a city that you’ve never visited before, and system 2 will kick in. You know you’re grinding the gears and you wish that your passenger would just shut up so you can concentrate. To illustrate another way, let me ask you – what is 2 X 2?, 4 X 4? and 5 X 5? Easy right? System 1. Now what is 13 X 19? 17 X 24? and 16 X 32? System 2. One set of calculations comes to us instinctively, the other, unless you’re a maths genius, requires use of conscious consideration (or a calculator!). Systems 1 and 2 operate in different parts of our brain. System 1 resides in an older part of our brain called the limbic system and this also houses the seat of our habits, the Basal Ganglia. It’s great because we can do things ‘without thinking’ and the brain loves to conserve energy and take the path of least resistance. It does though mean that in our fast world of fast thinking, things and people get left out. System 2 resides primarily in our prefrontal cortex (PFC), the CEO of our brain that sits just behind our forehead and the newest part of our brain to develop. The PFC is energy hungry and tires easily so it’s handy to let it become a little lazy and revert back to system 1…with consequences. Back to our role as leaders. Much as we like to think that we are there equally for all of our people, we have evolved to be biased in order to stay safe, and to save time and energy. It is those unconscious biases, driven by system 1, that, if we bring to our conscious attention, we can address – resulting in us leading even better. For example, do we tend to give our best projects to our brightest people? Do we mean to involve everyone in important decisions, but actually decide for them to save time? Do we ensure that once we’ve empowered someone, that we avoid checking in on them frequently? Neuroscientist Evian Gordon and Professor Roy Baumeister of the University of Florida identified that the primary function of our brain is to move us away from danger and threat and towards safety and reward. We do this on a scale of 5:1; we have 5 times more neurons dedicated to sensing danger than we do to looking for pleasure. This plays out in subtle ways every day at work. There are 6 core social needs that we all have that, when not met, can leave us feeling threatened and insecure. The following are examples of often unconscious leadership behaviours that can result in our people feeling under threat, becoming stressed and under-performing. 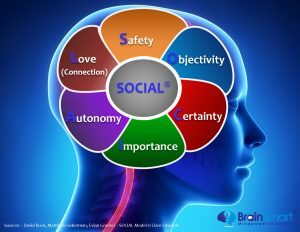 I have adapted models from Evian Gordon and David Rock of the Neuroleadership Institute to create the SOCIAL® model of core needs. All of these core needs we have developed from our earliest of days. For example, if we weren’t considered Important, no one wanted to procreate with us and we didn’t carry on the lineage. If we were cast out of the tribe, unwanted and unLoved, we would soon become lunch. If we weren’t Certain where the lion had its lair, or the enemy tribe were lurking, we were in real danger. Where might we unconsciously create Threat and Bias? I would like to invite you to reflect on some questions and consider if you have or do now, sometimes default to system 1 and not lead as well as you possibly could. Safety – how do I deal with someone’s mistakes? Do I create an environment where they feel safe to ‘fess up’ and I coach them on the learnings or do I do something else? Objectivity – does everyone have equal voice in our meetings? Do I distribute work equally or do I resort to the same people because I know they’ll get the job done? Certainty – how well and how quickly do I cascade information from my management meetings ensuring that everyone gets to hear the important points at the same time? Importance – how often do I consciously praise my people for something they did well, being specific about why it was good and the difference that it made, or am I just too busy for this? Autonomy – how much energy and time do I invest in delegation, giving my people the best opportunity to grow and develop and freeing me up to do the important stuff? Have I ever been considered a micro manager? Love (Connection) – how do I foster team spirit and morale? How do I grow the tribe and let each and every individual know that I care deeply about them? How much do I know about my people outside of their work persona? In my management career I had one goal and one goal only – to be a great people manager. It was one of the most difficult goals to achieve and I realised that it was aspirational and would never be ticked off on the ‘done’ list. Over time, however, I learnt how to step back and engage system 2; to make my actions deliberate, conscious and fair, especially after reflecting on the havoc I would sometimes wreak when I let system 1 be in charge of system 2 jobs! We know from the research that Gallup did over 25 years that people don’t leave their companies, they leave their managers. How might stepping back and engaging system 2 help make you one of those managers who people want to stay and grow with? I know – I’ve teased you for too long! If the ball cost 10c as many of you might have guessed, then the bat would have to cost $1.10 to be a dollar more than the ball, so together they would cost $1.20. The answer is the ball costs 5c and the bat costs $1.05c making them a total of $1.10. If you guessed 5c at the beginning of this article, congratulations, you engaged system 2!